The world of top-level sports management can be a fickle one. It’s a results-based industry and the line between keeping your job and losing it is very fine. However, there are a few who have managed to stand the test of time. Legends in their own disciplines, these giants have bucked the trend and are the benchmark that so many others are measured against. We wanted to take a look at some of these record breakers, if only to see if we can glimpse some of the secrets of their success. Our list isn’t exhaustive, and debate could probably rage for days over who should or shouldn’t be included. However, these coaches are perhaps the pinnacle of their sport and are definitely hard acts to follow. To get the only major piece of silverware in your sport named after you, you must have been pretty special. Legendary NFL coach, Vince Lombardi, boasts this very accolade. You might be wondering how you make this happen, well, it helps to win the first two competitions. Lombardi is best-known as the combative head coach of the Green Bay Packers, who he led to five championship titles in seven years – including three in a row. Today he is fondly revered in the U.S. as one of the greatest American coaches of any sport. Like Ferguson, Lombardi’s coaching record is impressive. He never had a losing season as a head coach and won 76% of all his games. 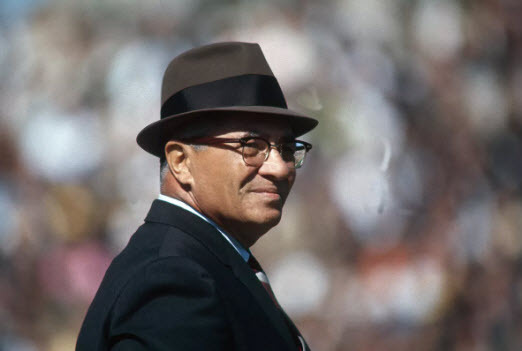 Amazingly, in the nine seasons he coached in the league, Lombardi won six conference titles and five NFL championships. He began his career as a high school assistant coach in New Jersey and it wasn’t until he was in his 40’s that he got his break in the NFL, as an offensive coordinator for the New York Giants. A four year stint here saw him land the job of Packers head coach, where he made an instant impact on the team. In just two years he took them from the league’s worst team to the championship game, which they narrowly lost. “This will never happen again. You will never lose another championship”. In a sense, he was right! The loss remained his only play-off defeat in an otherwise perfect record that saw the Packers win their five championship titles. It’s fair to say that any list of greatest coaches wouldn’t be complete without Sir Alex Ferguson. 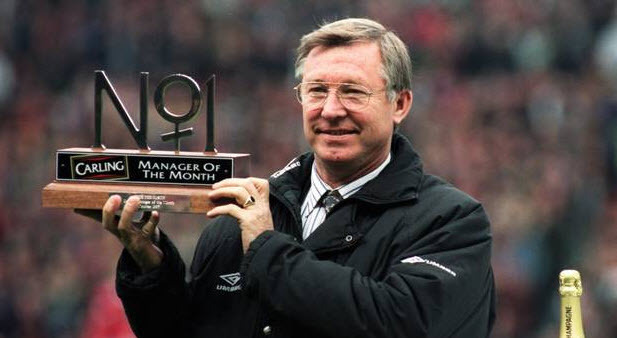 The Scotsman managed Manchester United for 26 years, amassing a staggering 38 major trophies along the way. However, Ferguson began to show his managerial pedigree long before he made the move down south and forced trophy cabinet makers in Manchester into production overload. The last time a Scottish team not named Rangers or Celtic won the league title, it was a Ferguson-led Aberdeen – in the 1984-85 season. Ferguson went on to collect an impressive 11 trophies during his eight year stint at the club, including a major European trophy. It was in 1983 that Aberdeen beat the mighty Real Madrid to win the European Cup Winner’s Cup. He was by no means an innovator in the football coaching world, but he seemed to have an innate ability to seamlessly move with the trends of the time. He also had a unique gift for coaxing talent from all age spectrums; from teenage starlets like Wayne Rooney, through to greying veterans like Teddy Sheringham. However, it’s fair to say he was brilliant and grumpy in equal measure. Stories abound about his famous ‘Hair Dryer’ treatment and that time he kicked a football boot in Beckham’s face. Ferguson simply had a knack for winning that is almost unmatched in the sport, having a winning record at each of the four clubs he managed. Most impressively, of the 1500 games he managed at United, he only lost 267, meaning he secured a draw or victory in 82% of his games. 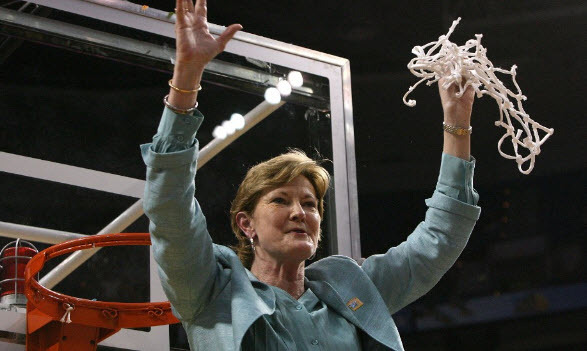 Pat Summitt may not be a recognisable name, but she is undoubtedly one of the most successful female coaches in history. As head coach of the University of Tennessee’s women’s basketball team, she accrued an incredible 1,098 wins, the most in college basketball history. She also won eight NCAA championships – the highest accolade in the sport – which is also a record. As if this wasn’t enough, she also won a gold medal as head coach of the USA women’s basketball team at the 1984 Summer Olympics. Amazingly, in 38 years as a head coach, she never had a losing season and only lost more than 10 games in a season twice. Summitt spent her entire coaching career with the Tennessee team, amassing a winning record of 84% of her matches. She coached the team to a 16-11 record, her first winning season and only her second year as a coach. She did this while not only studying for her master’s degree, but also training as co-captain of the U.S. Women’s Basketball team for the 1976 summer Olympics – which she would go on to win a silver medal for!! Her legacy is also incredibly impressive and is testament to how much time she put into her players. Every single person who played under her at the University of Tennessee in her 38 year career graduated from the school with a degree. As well as this, a massive 45 of her former players went on to become professional coaches somewhere. The New Zealander has had an impressive coaching career at both club level and international level. However, like Lombardi, Henry had little by way of a playing career before his managerial life began. His first major coaching role came by way of the successful provincial club side, Auckland. Amazingly, during the five years he was there, the side won four national championships in a row. The success garnered interest from bigger clubs, and Henry was snapped up by professional side Blues where he stayed for another three years. During his time here Henry won two Super 12 titles, narrowly missing out on a third with a loss in the final. Henry left New Zealand altogether in 1998, after losing out on the All Blacks job, but he quickly found work as the new head coach of the Wales national side. Here he led Wales to 11 straight test victories and became the first-ever Lions coach from outside the home nations. He returned to New Zealand in 2003, embarking on perhaps his most tumultuous – and successful – period as a head coach. His tenure couldn’t have started any better, with a 3-0 white wash of the 2005 Lions. However, just two years later fans and journalists alike were calling for his head after a quarter-final defeat by France in the 2007 World Cup. Four years later, Henry won the World Cup, with victory all the sweeter as not only was it held in New Zealand, but the team they defeated in the final were France, gaining revenge from four years earlier. 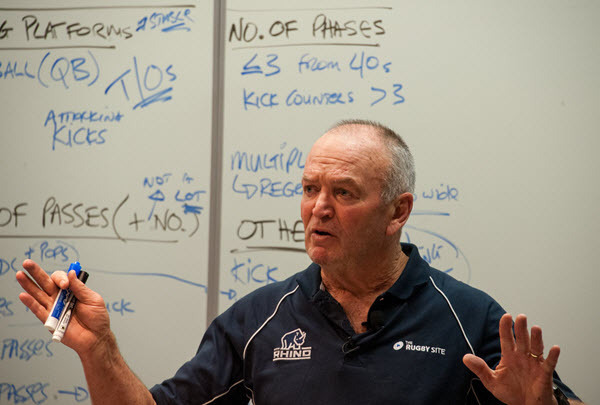 When Henry stepped down from the role as All Blacks head coach at the end of 2011, he did so as one of the most successful coaches of all time, winning 83 of his 103 – an 85% winning record. It’s clear that there’s no hard and fast plan to becoming a great coach. Their hunger and desire to conquer their respective sport can be found in countless coaches who fail to reach such heights. While we can’t distil the secrets of their success, we can still thank them for it. Having these amazing achievements to aspire to gives coaches all around the world that extra bit motivation, as we strive to match, or even surpass, ‘the greatest’. This article was originally published by Coach Logic, Coach logic a collaborative video analysis platform for sports teams. Better Coaches. Better Players..
Coach Logic and Don Vinson explore the merits of this concept in lower level rugby.